A chain is only as strong as its weakest link, so the saying goes, and if you're attempting to run an energy efficient operation, don't overlook your servo motor as the weak link. Certainly servos are highly respected as being energy efficient however, a misapplied servo can waste energy when it overheats. Well known for being energy efficient from the get-go, it is recommended that you examine the application for which the servo is used rather than (just) the servo motor. 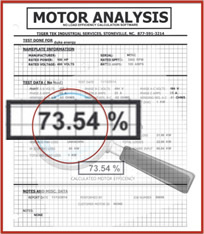 There is data within the efficiency curves that must be considered with regard to the motor's load and duty cycle that will determine whether the application is efficient. The torque curve determines the operating speed from torque and voltage. The thermal curve reveals the maximum operating temperatures. Within this curve is the safest operating area. Operating outside, or to the left, and your servo will eventually overheat. Look for operating areas within the curves in which efficiency declines, such as high torque and low voltage. Under high torque, efficiency is sacrificed for rapid acceleration while low voltage results in decreased efficiency when the servo is in high demand. Both high torque and low voltage are extreme conditions you want to avoid. Servo manufacturers recommend operating within a given range of load-to-motor inertia because it saves on current. When load inertia is larger than motor inertia, positioning speed and accuracy are compromised. If the load inertia dominates during deceleration, overshoot and setting time result. Large mismatches in inertia results in causing the drive amplifier to deliver more current. However, a 1:1 load-to-motor match in inertia results in current savings which translates to less energy dollars leaving your wallet. To ensure servo motor efficiency in your application, use the servo motor repair experts at TigerTek. Our experienced technicians will test, repair, and retest your servo motors to keep them operating at maximum efficiency.